I like my books like my coffee : Hot and Dark. My reviews might contain heavy spoilers! Read at your very own risk. A free copy was provided in exchange for an honest review, as well as for the blog tour. After years spent harboring a shameful secret, I finally felt...alive, reawakened and brave. Willing to break down my walls and let love in. Let him in. The voice and soundtrack to every one of my haunting dreams now had a face. One he won't easily let me forget. The hits Ben endured on the football field will be nothing compared to the devastating blow his heart will take if he finds out the whole truth. He knows the story, but he doesn't know the monster. Not like I do. Just as the wounds of my past had begun to heal, he's come back to rip them wide open. Great romantic suspense story ! Ben has been through a lot , he just finished collage and he is about to start law school. 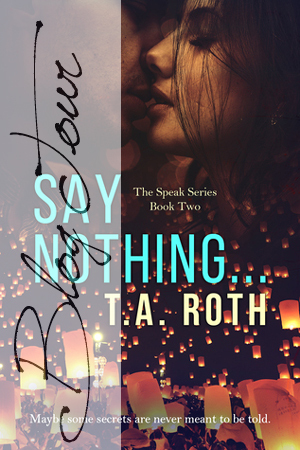 For Ari, Ben is her first serious relationship and she is hiding a terrible secret. She is afraid to tell Ben the truth because she doesn't want to hurt him. But all the lies and secrets are consuming Ari .This book is an emotional roller coaster ride for me. We had conquered our pasts. The truth had set us free, and we were looking towardour future. Until a crazy twist of fate brought my worst nightmare back into my life. The voice and soundtrack to every one of my haunting dreams now had a face. Onehe won’t easily let me forget. 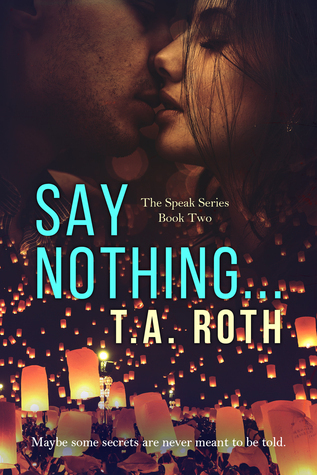 Say Nothing by T.A. Roth from Book Obsession Production onVimeo. T.A. Roth is a wife and mother of two funny and crazy kids. 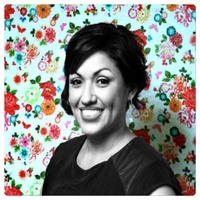 Born and raised in Los Angeles, she couldn't imagine living anywhere else. When she's not beautifying clients as a stylist/make-up artist at her day job you can find her reading, fangirling her favorite authors, or singing along to the radio. After getting the opportunity to read the debut novel of a then client now friend something clicked. Her "what the hell" attitude kicked inand a year later, here we are. REVIEWS AND THOUGHTS POSTED HERE MIGHT CONTAIN (HEAVY) SPOILERS ! READ AT YOUR VERY OWN RISK ! ARC generously gifted by the author.